A catch can test is used to determine how long to run an irrigation system or hose-end sprinkler and how well the water is distributed over the landscape. The root zone (where water and nutrient absorbing roots grow) is typically 6 inches deep in clay soil and 8 to 10 inches in sandy soil. Usually 1 inch of water will fill this root zone but in many cases irrigation systems apply water faster than the ground can absorb. 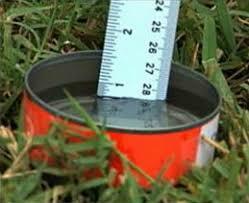 Place 5 to 9 catch cans (tuna or cat food cans work great) in each irrigation zone or station. Run each zone for 3 minutes to determine how much water is applied in each zone by measuring the amount of water in each catch can. To determine run time (time each station should run) use this example: if there is ¼ inch of water in each catch can after running for 3 minutes, to apply 1 inch of water set the run time for 12 minutes (This is just an example, your measurements could vary greatly). Some irrigation systems apply water faster than the ground will absorb 1 inch of the water. To avoid water running off the landscape into the street, you may need to run these stations several short times instead of one long time. With this example, set the controller to run 6 minutes 2 times. If the water levels in the catch cans are equal or near equal, your irrigation system is working efficiently (distributing water evenly). If the water level in each catch can vary greatly, go through the ‘Irrigation Checkup’ to improve distribution of water in that zone. Test each zone. Water application and distribution can vary by zone.